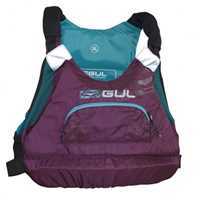 The Gul Pro Race 50N is an elite level buoyancy aid. Using PVC foam means the structure stays soft and comfortable while keeping its buoyant properties. This super soft lightweight PVC foam Buoyancy Aid is ISO approved. The non zip design means it can slip over the head so that it's easy to get on and off. Perfect for any style/class of sailing.